It seems fitting to start my reflections by devoting some attention to jasmine, which is not only my favorite fragrance note, but also the most widely used perfume ingredient, be it natural or synthetic. While the rose is “the queen of flowers,” jasmine is indisputably the king. The original habitat of jasmine is considered to be India, which alone possesses about 42 species with various olfactory characteristics. In India, Ghazimpur has traditionally been the center of jasmine cultivation, while in Europe, it was Grasse, France. The jasmine was first cultivated in in Provence in 1548, being a gift of the Arab trade network (Morris 1984, 104). Today, jasmin de Grasse is the most expensive jasmine available, and the only widely available perfume using it is Chanel No 5 extrait de parfum. It is sweeter and fruitier than the more commonly available jasmines from Italy, India, Morocco and Egypt (responsible for 80% of jasmine production). 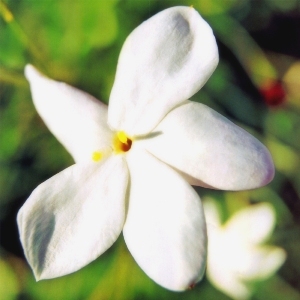 Jasminum grandiflorum is the most widely used jasmine in perfumery. Its scent is opulent and rich, with a sweet fruity note reminiscent of apricots and bananas. Underpinned by indoles, molecules that smell of ink and moth balls, the aroma is inexpectedly sensual. Jasminum sambac is a nightblooming jasmine. It is heavier on indoles than Jasminim G., and its scent is darker, greener and more animalic. The flowers of this jasmine are used to flavor Chinese tea. Unlike rose, jasmine is too delicate to withstand steam distillation, therefore, the process to extract the oil traditionally followed a complicated enfleurage method, which required flowers to be hand picked and layered over a glass frame coated with a mixture of animal fats. After the fats would become enriched with the jasmine oils, the flowers are removed and the essential oils is separated from the fat through a process not unlike a solvent extraction, using ethyl alcohol. Today, jasmine absolute is extracted exclusively via solvents. 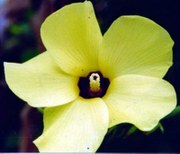 The perfumer’s palette also includes numerous synthetic jasmine substitutes. While they cannot rival natural jasmine’s beauty and complexity, they are widely used. Not only are the jasmine synthetics more affordable, they also allow for effects prized in today’s perfumery: radiance, freshness and lack of strong animalic notes. One example of a light and luminous jasmine material is hedione. Jasmine soliflores: Serge Lutens A La Nuit, The Different Company Jasmin de Nuit, Maître Parfumeur et Gantier Jasmin, Norma Kamali Jazmin, Molinard Jasmin, Chantecaille Le Jasmin, Montale Jasmin Full, Miller Harris Jasmine Vert. It is a fragance represented like a loukoum,made of honey and almonds,with a kind of roses liquory. 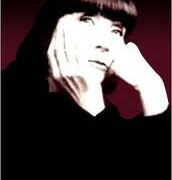 Many people don’t know a thing about MONTALE,i am so happy to see that you know them. Such a pleasure to talk with you about perfumes. fieldsofflowers: Just a side note on the “jasmine” scent (as someone who has grown multiple varieties for years). Because the “true” jasmine scent is so hard to extract from the flower most “jasmine” scents wind up being dark and animalisitc. Jasmine blossoms themselves are not very dark or animalistic at all. They actually posess a rather light, clean fragrance mingled with their richness and sweetness and sensuality. Tuberose, for example is a much “heavier” scent straight from the flower than is jasmine (grandiflorum, sambac or others). So, perfumes that are “animalisitic” and “heavy” jasmines are actually much further from the flower. When someone says that a “clean” jasmine scent does not posess a “true” jasmine quality I believe it is because they are not acquanted with the flower itself. Because a “true” jasmine scent would probably be MUCH cleaner and lighter and fresher than most animalisitc jasmines and jasmine blends. I have found, so far that finding “true” jasmine scent captured in a perfume is near impossible. So far, I haven’t found one. One of the better ones though is Keiko Mecheri’s Jasmine. It is a sight “cleaner” than most jasmines and posesses qualities much closer to the actual flower than many. Although it too, is NOT “true” jasmine. (just the closest I’ve found). I was just browsing in the blog and I came across this post. Just what I was looking for. I am endlessly seeking a jasmine scent – which is just like in a good cup of jasmine tea- clean, fresh, feminine and uplifting. Victoria: Ines, it is very different from the original J'Adore, much lighter and fresher, so if you see it at Sephora, do give it a try. Maybe you perfume lovers can help me. I am going to Grasse for the first time next month and want to buy some Jasmine perfume without breaking the bank. Any ideas of where I might visit for something fragrant, regional and beautiful, but still inexpensive. Maybe a manufacturer or outlet or local shop? Any advice would be appreciated. I read your thread. Did you get any advices? I am going to grasse in august, and I am really thinking about those things you did before you let. Did you get any experiences when you were there? Experiences worth sharing?